I’m hosting my first Start-Your-New-Story Saturday January 5, so lovely earth angel goddesses like ourselves get to do exactly what we’ve promised ourselves every year… spend a day just for us, creating and planning the year ahead…together! 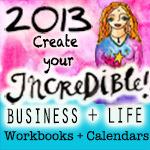 Amazing and awesome goddess Leoni Dawson has put together two BEAUTIFUL, inspiring, FUN and COLORFUL Workbooks and Calendars to get you started. Choose one…or you can bring any other favorite tool you like, or use one of mine. I, of course, will have lots of resources of many kinds on hand too. The only agenda is to spend the day together and FOCUS on what DELIGHTS our HEARTS and SOULS…and openness to create it into BEING in 2013! There is a modest investment involved. If it feels restrictive for you, offer what feels easier. Our goddess dance with money, love, and making a living is definitely part of our planning, conversation and creating this incredible year! So here’s the rest of what you need to know for Start-Your-New-Story Saturday. Let me know you’re coming! Previous Post Do you Want change?